Was Michael Jackson trying to become white? I think Michael Jackson was one of the most talented entertainers of all time, but I also think it was totally obvious he was trying to be white. I don’t mean trying to be white in a cultural sense, but rather I mean he was literally trying to physically transform himself into a person of European ancestry. Here’s a video showing how his face transformed over the years. Obviously he’s trying to look Caucasian. His skin is whiter. His nose is getting thinner every six months. His lips are getting thinner. His eyebrows are getting higher. His eyes are getting wider every time. His cheekbones are getting bigger. In other words, Michael Jackson’s lighter skin was part of a larger pattern of becoming more caucasoid looking, so Occam’s razor suggests he was deliberately trying to change his race. But because black people are supposed to be proud of their race, he probably fabricated the skin disease as a way of saving his public image among those naive enough to believe him. Now Jackson fans insist that he really did have a skin disease and cite the fact that his autopsy stated he had vitiligo. However there are two kinds of vitiligo: primary and secondary. In my opinion, Jackson had secondary vitiligo, meaning he probably used his wealth and power to get access to powerful skin bleaching treatments normally reserved for people who really do have a skin disease and need to depigment to even themselves out. Indeed after Jackson died, detectives found 19 tubes of hydroquinone and 18 tubes of Benoquin in his home. In other words, I think Jackson chemically induced his “vitiligo” himself, on purpose. According to Jackson biographer J. Randy Taraborrelli, Jackson began lightening skin way back in the 1980s using the over-the-counter skin-bleaching cream called Porcelana and Jackson and his sister La Toya had crates of this cream stored at their family home Hayvenhurst, “hoarding it as the most valuable beauty product ever produced”. So although Jackson was one of the extremely rare African Americans to achieve incredible wealth, it seems his enormous fortune will be inherited by what appears to be completely non-black children. UNDERSTAND, MJ WAS NOT A RACIST. But he was self-loathing. MJ didn’t care if you were Black, HE DID NOT dislike Black people, HE just did not want to be Black. It’s a fact. I say this as a Bi-racial American who was at first horrified by this truth, and then upon seeing for myself that there was really an “illness” behind his actions, I came to pity MJ. MJ just didn’t find Black beautiful or attractive, & he certainly felt that Blacks were intellectually inferior in a majority areas, especially in business. WHO KNOWS HOW OR WHY he came to be this way, BUT HE DID. However despite the fact that Jackson apparently did everything in his power to rid himself of his blackness, black America will continue to love him because his incredible talents and creative genius brought great pride to black people and helped break down racial barriers. It’s not unheard of for people to alter their physical appearance ie. weaves, hair dye, colored contacts, skin bleach, tanning and cosmetic surgery. I don’t think most who do these are trying to look like another race. But some probably are. Given the extremes MJ went to it’s probably true. There are signs in a couple of his songs with a preoccupation with race ie. blacks and whites. His having white children is creepy. It’s always a bit creepy when people go out of their way to adopt children of other races. Of course, there are a lot of whites (especially celebrities) who do this ie Madonna, Jolie, Theron, Spielberg, etc. I don’t think most of them are trying to be black so much as having some kind of white savior complex. MJ’s children are more extreme in that he paid for someone else to have IVF with a donor rather than simply adopting a child who needs a family. Combined with the extreme lengths he went to with bleaching and cosmetic surgery it’s fairly obvious that it was racial. I think that when a white celeb adopts a black child it’s seen as an act of charity. It makes the white celeb look like such a nice person that he is willing to give a good life to someone from a less privileged race. This gets good publicity because the purpose of charity is to help the least fortunate. By contrast, when blacks embrace whiteness, they are seen as self-hating Uncle Tom sellouts. In general, embracing a less powerful race or ethnicity is considered charitable. Embracing a more powerful race or ethnicity is considered sucking up..
Social dynamics works in favor of the more powerful and influential. Dating is a good example. Is voting liberal considered “embracing blackness”? I am European, I have socialist (social democratic) political views and I’m not “embracing blackness” with my vote. I am embracing social fairness and justice. MJ didn’t want to be “white”, but he suffered from self loath and this was his chosen way to change /morph into someone else and at the same time inflicting self harm. All the painful whitening treatments and plastic surgeries. It was self harming. He was a very sensible child, his parents broke him. Your theories about ‘whiteness’ and ‘blackness’ don’t go to the core of the issue at stake. They are only scratching the surface. MJ did what every abused child wants to, morph into someone else, someone who is loveable. And he did it “his way”. (Didn’t think I would ever defend MJ but here you go). beyonce another black celebrity who goes to great lengths to appear white . It’s hard to blame them though..did MJ really want to look like Bill Cosby, when he got older? His fans are extremely naive to believe his claims about a skin disease & to believe he’s the biological father of those kids. Can they not put 2 and 2 together? Michael Jackson was a freak and the biggest Uncle Tom in history. For such a globally iconic figure to reject his race so blatantly set the civil rights movement back 20 years. How is it mental illness? When A is immersed in a culture where A’s core identity in the culture is determined by “race,” and A’s race is constantly denigrated in many ways….the fact that A wants to somehow change his race is “mental illness?” Are people who get plastic surgery suffering from mental illness? The implicit associations test shows that blacks themselves learn to loathe other blacks. The evidence is overwhelming that human culture drives most human behavior and trait development — and this is yet another example. Genetics drives the majority of human behavior, NOT culture . Also, it has been proven multiple times that Blacks have the highest self-esteem of all races, which wouldn’t be possible if blacks were somehow “conditioned” to hate themselves. Both Michael Jackson and Quincy Jones had a history of mental illness related to race-based self-loathing. Which is unfortunate, because both men are very talented. Quincy Jones is one of top music producers/composers of the 20th Century, regardless of musical genre. I think Michael Jackson was also talented, although a lot of his music is too pop for my tastes. I think MJ is an interesting case study in that he seemed to be extremely lacking in ethnic interests. Nothing in the news inspired this post, I’m just generally interested in celebrities, especially since becoming one myself. And of course it would make sense that highly creative individuals suffer from mental illness. In Latin America, blacks who have a drop of White are considered “White”. In North America, a mixed person who has a drop of black is “black”. So Mulattos in Latin America are more respected. A black Hispanic whom I once met said that African Americans should leave the country, because 1) blacks are not capable in competing in a ruthless capitalistic country where a combination of high IQ and nepotism are required to succeed (nepotism meaning hiring and only supporting people of your racial background; Whites and especially Jews have practiced this successfully) and 2) they cannot compete with other non-White groups who also practice the same as 1). Latin America has lower standards and is less competitive. A country that is both racist and highly competitive puts blacks at a very deep disadvantage. “Through its monopoly on violence, the State tends to pacify social relations. settle personal disputes as he saw fit, and the Church’s opposition to the death penalty. as many offenders dying at the scene of the crime or in prison while awaiting trial. It’s possible that those kids aren’t White either. It is possible that the biological father of the kids was/were mixed race. I would believe it if it was found out that the bio dad was Hispanic or Middle Eastern. I would also believe it if the bio dad of the older twins was 1/4 Black and the bio dad of the younger child was 1/2 Black. I think one more interesting points about Michael Jackson is the quality of his plastic surgery- here is a guy who was one of the richest men in the world, who should have been able to afford the best in medicine, and all he could get was a freakin scarecrow face? If he wanted to look like Elizabeth Taylor (it’s said that he wanted look like a mix of Elizabeth Taylor and Jodie Foster), then he could’ve gotten a template or something to put over his face to help the surgeons out while they were carving on him. Anything would have been better than what he got! Well as the doctor explained in the third video in my post, the plastic surgeon did do a good job drastically changing MJ’s face and race and giving him the look he probably desired, but MJ apparently became addicted and couldn’t leave well enough alone and the extent of the surgery eventually backfired. There’s only so much a face can take. While we focus on his face and skin color, Michael Jackson managed to transcend a color barrier and became international in a way instead of ending up as a has-been on a soul radio station like his brothers. In terms of talent, the best singers are black and yet there is cultural discrimination against them (or as I suspect, a desire for record executives to prevent their black artists from imploding from fame). In this respect, I suspect a minority “acting white” must have higher iq than average because one, the only way to overcome discrimination is to be smarter than competition, and two, “acting white” is adapting to one’s environment. In a way, Michael Jackson is like Freddie Mercury. Both show intelligence and insecurity and thrived in a predominately white medium. The biggest downside is that these minorities tend to be depressed and disturbed as if taking in a red pill. Whether it is from being a minority or being isolated or from high intelligence is the real question. MJ had White admixture like many black americans. Just look at the pics during his youth with Jackson 5. He was also the best looking and the most talented of the bunch, and didn’t even look like his older brothers, which leads me to suspect of that they are only half siblings. It was rather tragic how he turned out at the end. why do you separate white from middle east. It’s very telling that the world’s biggest black icon paid two white people to create children for him. Something wasn’t right there. NO matter how much people want to deny it, there is something very wrong with a person who pays to have children created to live in a fairy tale world of his own invention. The youngest child looks like a Latino, nothing black about him. What black man who is sane in the head wants his sons to have long silky flowing hair down their backs? Michael Jackson wanted this type of hair for himself, hence the reason he had so much pride in Blanket;s hair. Calling him a black icon is a joke. Older Arnie Klein and Prince with same features. The lies and deception of trying to pass those white children off as his own reeks of his delusions and insanity. The saddest thing is to see his black fans trying to convince themselves that these white, and Latino kids are from his seed. It would have been one thing to adopt children who already existed, but no, he wanted two brand new white babies to call him daddy. He went on a third time and created a child that, although not white, is not black either, and has none of his original features. So pathetic. That kid is the spitting image of Klein. But why would Jacko choose Klein of all people to be the bio-father of his son? why would a “teacher of graduate students in biology who looks like Gisele Bundchen” comment on anything related to Michael Jackson and on urine-urine’s blog? Wow, they look like the same baby. It’s very obvious that Michael did not want to be a black man, he’s a black man who suffers from self-hate. I am a MJ fan, but I’m not a delusional fan. I see that he went to great lengths to erase his black features. He was so beautiful as a black man, the lighter he got, the weirder he started to look. Don’t get me started on the Vitiligo, for one I don’t at all believe he had Vitiligo, that was a lie he and his PR people came up with to deceive the public and people fell for it. The plastic surgeries, he did everything to erase his beautiful black facial features for white facial features. He lied and said he only had two nose jobs! No i don’t buy that at all, you can look at the man and obviously see have had multiple surgical procedures. I love Michael, but if it quacks like a duck, if it looks like a duck well dammit it’s a duck! I’m just keepin it real. He had vitiligo brought on by using benoquin, A fake, a liar, a phoney, just like his purchased kids and his weave. His weave was brought about due to his head/hair catching on fire while filming a pepsi commercial. It was a 3rd degree burn down to the cranium and left a spot where his own thick natural hair never grew back. The hair follicles were burned away. That said I believe he wanted to have the look of a European non-black man. He did not want to look like his father Joe Jackson and didn’t want biological children who’d look like Joe. Well,he might have fooled you,but not me. Whether it was from burns or vertiligo,the facts were clear he wanted nothing to do with Black features,that’s why he was even gone too soon because he clearly was causing confusion among black people. Many black people will tell you that MJ had identity issues. all interesting but forget that vitiligo was confirmed in autopsy and that Prince suffers. There are two types of vitiligo. Primary and secondary. Primary is genetic but secondary can be self-induced. It was secondary vitiligo that MJ appeared to have. I don’t believe it was genetic in MJ’s case and even if it were, Prince does not appear to be genetically related to him, and Prince’s “vitiligo” has not been confirmed. Look i dont think vitiligo made him completely white of course because that is not how the disease works. That said i think he likely dyed the rest of his skin to make sure the patches that vitiligo causes did not show. Everyone knows he was always troubled by his looks. So there is no way he would want to live a life where he had patches on his face and body showing. I dont think it had anything to do with being black or white, simply looks. There is more proof that this is true then saying he wanted to be white. Some people might say then why does he have white children but that is not 100 percent proven even if it is very likely. 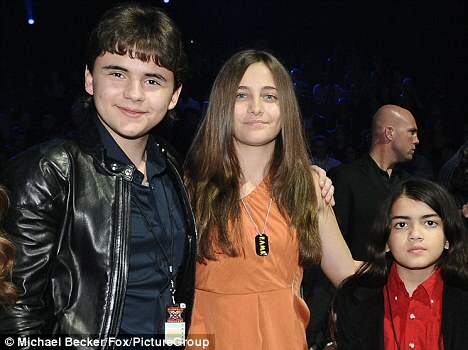 Besides i think the youngest child is definitely his blood, that kid looks a lot like him even if the others do not. So you can’t say he was ashamed being black if he gave one kid his blood.